At the end of each training we ask our students to give feedback about the Trainer, environment and what they learnt. Here it is separated out for you by the Training type so you can see what others think about our courses. 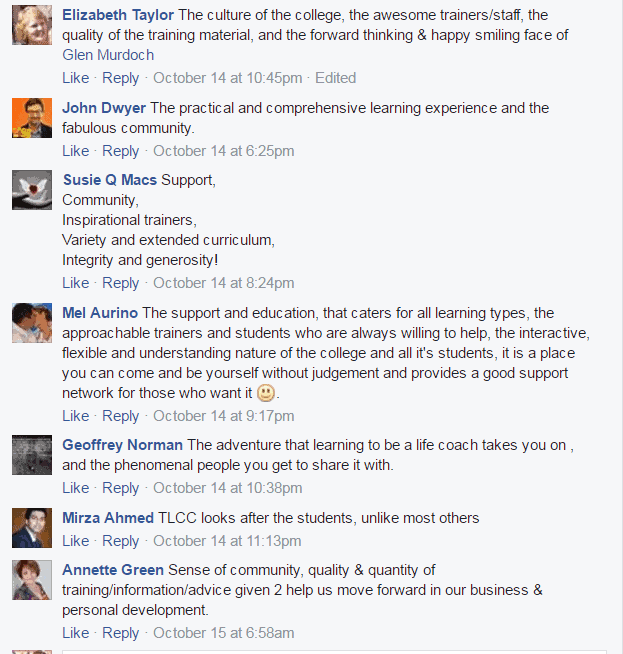 To check out feedback for a particular training just click on the link below. I could not have imagined a better trainer for the weekend than Jo Wise. Immediately I found her so inspiring, warming and knowledgeable. The way she could be on our level yet teach us everything we needed to know was incredible. Jo has a hilarious way of training that could not make me want to get out of the room faster.....to start coaching of course ha ha Boof and Carly were great in the room over the weekend. their advice and conversations were so helpful. The content was on a great level for the knowledge we had before we started the weekend. The people in the room were so like minded and are a great network to have. I really connected with most people throughout the weekend. I even got facebook again to keep in touch throughout our journey! LIFE HAS CHANGED ALREADY. opps I didn't mean for capitals...although it works! I am a beaming ray of sunshine (even more so) today. I can not wait to get out there, start and gain the experience and confidence. 10,000 hours right...BRING IT ON! The trainer was a master - receptive, engaging and expansive with knowledge. Great content - easy to follow and great way for participants tiengahd and empower each other. The people were keen and very friendly, willing to share and play. My life has changed already and will continue to change as fir me it is another wonderful journey of tribal leadership. It validates that I am on the right path. Thank you for your support and guidance. I thoroughly enjoyed the weekend and Jo was a fantastic presenter, very personable and presented the information fantastically. I loved the fact that it was a small intimate group allowing for questions and interaction. Trainer was confident, experienced and communicated content well. Content was good - high level enough to cover a significant amount in the sessions and detailed enough to implement. People were friendly and motivated The sessions left me both excited for the future and nervous about taking the next step and looking for a client. Carolyn made me feel very welcome, all participants were encouraging and we all felt comfortable together. I felt a powerful tool was missed. It was weekend of stepping out of my safe place which I was entrenched in especially over this year up to then. I am so grateful! This course and its content was fantastic. Our trainer was amazing and catered for everyone. Everything was explained in detail. I met some great people who I am keeping in touch with. I have learnt so much over this weekend. Especially about my own values and beliefs and seeing how the wrong ones affect your life and thoughts. I found the course amazing. Jo was a fabulous Trainer who delivered the training, so you understood the points/tools to a deeper level. Since going on the course, I spend my time thinking about what I learnt and how I can put it into practice. Its also made me hungry to keep learning. The other element which I really loved was meeting like minded people who I can share my experiences with and stay connected with in the future. I really loved the Coach Mastery weekend. I feel I learnt a lot and the experience surpassed my expectations. Nadine was great! She had the answers to all of my questions (of which there were many) and I felt she was very experienced, supportive and honest in her approach. She shared personal anecdotes which I found really valuable. The content I found really interesting and the days flew which I think is a sign of being really engaged and in flow with the course material. We had a wonderful group of people attend the weekend and I felt so much love and support in the room. The intimate experience also aided with forming good rapport with the participants and I learnt a lot from the other participants and their experience. The weekend really clarified in my mind that I am on the right path and although I have a long journey in front of me, I am excited to begin what I’m sure will be a life-changing and rewarding experience. I look forward to meeting the participants again at our next training session in a few months!! Really great and has given me the confidence to go out and reach clients. im looking forward to what else is in store! Catherine was excellent. Held the room well and was very animated and used lots of metaphors/examples that helped me understand some of the techniques. The tools that I have acquired out of this NLP training are amazing, and I have already experienced less anxiety and stress since clearing it this past week. The group was very supportive, friendly and respectful. I have formed some great friendships already. I am looking forward to sharing the coaching journey with my fellow colleagues. The environment/office space was quite good. Although given the group size, it was a little difficult to stay focused during some of the patterns as there were other pairs coaching right next to you. More private space less numbers would be better for when actually doing the coaching 1on1. Hi all at TLCC. What an amazing few weeks I have had completing the NLP training with Catherine, Nadine the crew and a fantastic group of coaches. I feel the content of the 7 day course was very fulfilling. So much information handed over with pure professionalism, guidance and enthusiasm. Whenever feeling a little confused the training team and crew members were quick to assist when needed. The person I have found within myself is something else! With still a lot to retain I see myself, my life and my future in a whole new light. What was my favourite? It all!! I must say that clearing my negative emotions has had a profound effect on how I deal with the world around me so I would like to say a huge thank you for that and every other element of the course. I am looking forward to August. Amazing NLP training and totally life changing. Learnt so many skills that I can apply straight in my own life and integrate into my couching practice. Changed as a person over just 3 weekends which is pretty extraordinary. People in the room were fantastic - very supportive, open and honest. Catherine and the helpers did a fantastic job and well done to Nadine - she is on the way of becoming an awesome trainer. Thank you again!! I absolutely loved NLP training. Cath & Nadine were amazing. The energy, professionalism, support,humour, the content was the best. It was a safe environment for me to allow myself to be open & learn. Thank you, thank you, thank you. Cath was amazing, the content was life changing, the people have built me a really strong network of people I can reach out to for advise and the NLP & Matrix Therapies qualification will take my business to the next level. I really look forward to changing people's lives! The training session was UNBELIEVABLE! I feel like a different person with a completely different view on the world and the people in it. Cath Bell is simply fantastic! She has an energy about her that is so warm, friendly and approachable which enabled me to get the most of each and every session. Even though the group was large, friendships were made and a professional respect for each other was achieved. I recommend this training college and the training packages to all I know! Thanks for a professional and educational training package! I loved the training, Kath was a very professional and genuine trainer that was fully invested in ensuring we all got the most out of the course. The fellow students were a joy to accompany, it was great to meet fellow tribe members. The content was extensive and mind blowing. I have done and will continue to, use it to enhance my everyday life, the life of those around me and my future coaching business, thank you! Cath is an exceptionally skilled trainer. The program was jam packed with useful and effective tools. She manged the group very efficiently too. Catherine Bell is an absolute stellar trainer her level of professionalism, care and her ability to keep the training flowing are exceptional. Nadine Bowen has the wonderful ability to assist in a way that makes you say "Oh now I see how to do it" without ever making you feel that you were wrong or not doing it well enough, she just gives you what you need to make easier and makes you feel better about it. Nadine is going to be a great trainer. The content is amazing and completely mind boggling. I would like to see something specifically for smokers, drinkers and gamblers. The people I met were conscientious, committed, amazingly supportive and caring. The world is a wonderful place full of potential and exciting new adventures. This training is as life changing as you want it to be we now have the tools and understanding to make positively limitless. NLP training was so incredibly delivered by Catherine and Nadine. The enthusiasm, input and energy was well received. The training content was fabulous, however exhausting at times, with clear guidance and an easy flow of delivery and revision. The best training I've ever had. The course was excellent, trainers were excellent. Certainly an eye opener and great experience working with such a diverse group of people. The only thing I would have liked is more time for conversation and questions. There was time but I felt we would have all liked more time for this. Overall great thank you. Awesome 7 days with Do and jo jo.Extrenely engaging, professional, practical and done with integrity.Generous in their offer of giving me time At lunch time to chat about things.wonderful training... could not fault. The trainers were very professional in their presentation, to the point, very helpful. The content was useful for personal growth as well as for coaching business. The people were so friendly, beautiful group. Life changed in a way that I look inward and be more at cause. JoJo and DJ and Beautiful Lauren were all so amazing! They really know their stuff and it was an honour to be trained by them. NLP was everything I expected it to be and more. All of the trainers showed such great knowledge, patience and compassion and together made my learning experience comfortable and enjoyable. The content of the training was jam-packed with information. Sometimes I felt a little rushed, I guess I need a bit longer to process. But now I can take my time and go over all of what has been taught to me. The people I have met have become my new network of supporters. A lovely group of like minded people moving towards a common goal, which is really nice. I would also like to mention the crew Paula, Tiffany and Anna who attended my NLP classes, who were all very helpful especially Paula who actively contributed to our classes. Thank you for another Great Class!! Wow! We just don't realize just how powerful our minds are, NLP opens up so many new possibilities in regards to coaching! The course was amazing, with so much information to take away and use. I'll be doing my NLP masters with TLLC in 2017! Grace is very knowledgeable, training was very fast paced and what would work well is having a microphone as it was difficult at times to hear. The content was well delivered; The fellow student - well they are an awesome bunch. I have overcome some phobias - really benefitted from the Timeline Therapy and just overall tools which will help me to be a better communicator and understand me better! The three weekends were amazing. People kept telling me - "wait til you do NLP- you'll love it" and I did! Cath was great, they way she handles all the different personalities, different experience levels and the energy level of the group was awesome. I think I not only learnt all the NLP tools but some workshop ones as well. Cath is an awesome trainer she makes the learning fun and interactive which heightened my learning of NLP. I loved how it felt like she was totally focused on all of us individually! I also noticed myself practicing NLP without realising at the time I was actually doing NLP. Cath is honestly one of the best trainers I have worked with! Thank you for an outstanding training Cath! It was amazing watching the other students and myself learn and grow throughout the training, it has reinforced my desire to improve myself and help others live the life they desire! Thank you, thank you, thank you! 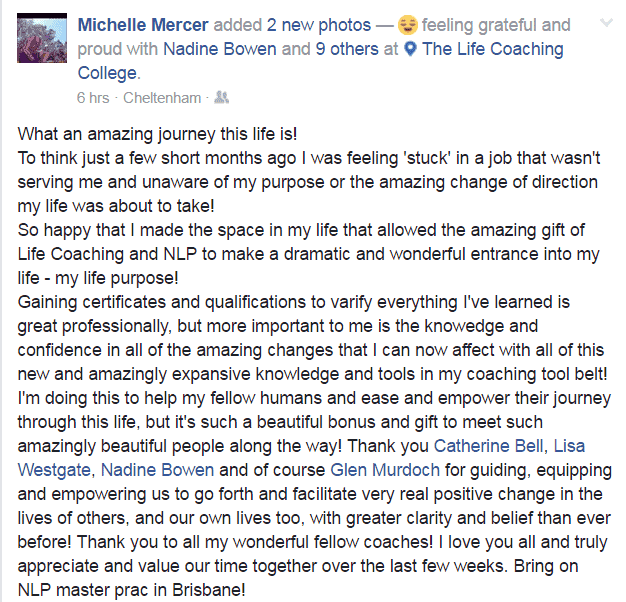 Before going to NLP, I was warned that it could possibly be "life changing"!! Little did I know!! I honestly could not have asked for a more rewarding, enjoyable experience. To understand and see first hand just how we can take control of our own minds is such a powerful experience in itself. To put into practice the methods and techniques on our fellow students and see them have a shift right in front of our own eyes, was even more powerful. After my first 3 days with Catherine, I had to admit to a fellow coach that I had a massive "girl crush", in a truly professional way!! That lady is the BOMB!! She is an absolute powerhouse of information, energy, compassion, strength and personality. I honestly feel blessed to have been fortunate enough to have her as my teacher because she gave 120% every single day!! To Glenn and all the team at TLCC who make these training days possible for us, I say THANK YOU!! Job well done!! I'm now trying to work out a way to attent the next NLP week in December. Going further with NLP wasn't even a consideration a month ago, but it most certainly is now!! Catherine Bell was very informative and caring. I loved her delivery style. She was at all times professional and delivered content in a timely manner that also aloud class discussions that helped to understand the content even more. Everyone that I have met on my live training weekends have been beautiful. i have made some great friends through this study that I will remain in contact with. I have been using the skills that i have so far learnt in my current job and also been working on myself, i am feeling positive in the knowledge that Life coaching will be something that I will happily do in the future. 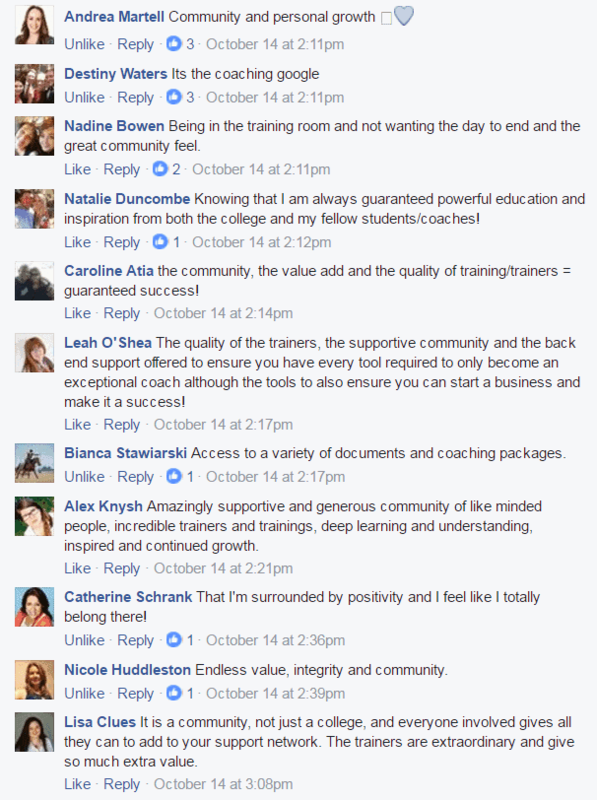 MPNLP completely changed the way I approach coaching and conduct my sessions. The class as a whole and Cath Bell our Trainer were all extremely professional, and wonderful - inspiring confidence while maintaining firmness and direction. The content was phenomonal and it was good to do a bit of revision and then dig deeper into the subjects as well as combine things together. What surprised me most about the course was not sharing alot with my partner, yet their comment "well the course your did, didn't just fix one person, it fixed two". The enthusiasm, confidence and drive I had received through the course, rubbed on on another unconsciously! Catherine Bell is a master/mistress of her art of training and coaching.She manages to impart information and experience in an energetic, professional and authentic manner. Great bunch of people. It was really great to see the change in energy and flow in the trainees throughout the week. Great content that is useful and that I'm already applying at my work, home and with my coaching practice. My life has changed for the better in so many ways. Thank you. An incredible, life-changing experience. The trainer was top notch ensuring we all participated and learnt the material. The other students were a wonderful, willing group and we formed a special bond during the training. New goals were formed and old limitations were busted for all of us. Most surprising of all is what was unleashed from my unconscious mind...and I'm excited about the future!! OMG! What can I say? My life has just been transformed. A massive shout out to Catherine Bell who is an a-mazing educator and trainer! I can't wait to continue my business studies with Cath next year. Amazing training, changed my life! I found the training life changing and very informative. Mark was an amazing presenter who kept us fully engaged for the whole 4 days. He was very professional and supportive in all aspects of the training & provided positive constructive feedback throughout. Prior to the training I had started reading about our other brains but had no idea just how awesome the info was and the content in the training was easy to follow and implement. I came home after the training & started to use the content in my own personal growth and look forward to sharing it with my clients. I didn't totally understand the significance of breathing deeply & slowly until the training and I have already started to see results. The other key info I have taken away from the training is the importance of listen to all 3 brains & being aware of when one is talking over top of the other 2!!! Thanks Dec for finding Mark and providing the training for the college. You rock!!! Mark was a knowledgeable trainer who led us methodically through the scientific research of multiple brains and then introduced us to the application of mbraining. His training was the perfect capstone learning experience to the Advanced diploma degree. I was delighted to experience the training with a few of the students I had taken other classes with. The combination of Mark's professionalism and the high quality coaches I learned beside made it a great training. Through mbraining I can live as the highest expression of myself. As a Trainer, Mark was simply outstanding. Wonderful rapport, warm, engaging and thoughtful. His knowledge was inspiringly shared, with humour and was very well paced and structured. Kept me fascinated the whole time. I'm definitely a mBit fan! Already integrating newly gained knowledge in my life and teaching. Love it! As always, enjoyed wonderful connections with other students. 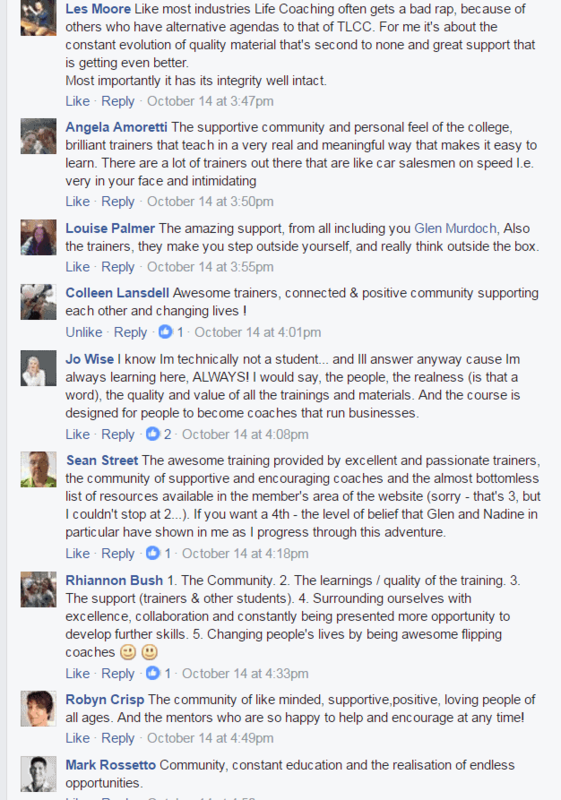 And would be stoked if Mark and Eileen were able to offer some of their other courses within The Life Coaching College. Thank You : ) ! I was so happy to have completed this training of my mBIT Certification. The trainer Mark Klaasen was engaging and his delivery style catered to all learning needs with his wealth of knowledge, it was fantastic. Highly recommend this program. Awesome! I now have another coaching method that my clients will benefit from adding to my suite of certifications completed at TLCC. Mark was very caring and professional. All of the students were pleasant as usual for a TLCC course. It's great to have another tool to be able to use to help my clients. Mark was a brilliant trainer - one of the best, really professional, knowledgeable and structured the training to optomise learning. mBit is a fantastic coaching process, I'll be using it heaps for myself and my clients, it fits perfectly with NLP & hypnosis and I love that is has a scientific background. Thanks heaps for bringing it back to the college.